We’d love your help. Let us know what’s wrong with this preview of Your Life as Story by Tristine Rainer. To ask other readers questions about Your Life as Story, please sign up. It is a bit rare these days that I rate a book as amazing. This one is for me. I began reading this book because I’m writing my master’s thesis on spiritual memoirs and I figured that reading a book about how to write “memoir as literature” would be a good idea since it might give me a jump start on analysis. In the back of my mind I’ve long had the idea to write a memoir about my dearest brother who was like a father to me. Well, this will be my guidebook when that time comes. Rainer’s lifelong It is a bit rare these days that I rate a book as amazing. This one is for me. I began reading this book because I’m writing my master’s thesis on spiritual memoirs and I figured that reading a book about how to write “memoir as literature” would be a good idea since it might give me a jump start on analysis. In the back of my mind I’ve long had the idea to write a memoir about my dearest brother who was like a father to me. Well, this will be my guidebook when that time comes. Rainer’s lifelong interest in diaries and memoirs as well as her screenwriting has helped to create this entirely thorough and literate book. Written in 1997, she was teaching classes on writing the “new autobiography” and I notice now she has earned a PhD and continues to teach through her Center for Autobiographic Studies as well as a couple of universities. This book includes a history of autobiography, an analysis of “what is story” as well as countless exercises to work the reader through writing his or her own memoir or autobiography. Her exercises are based on her research and her classroom application. The pages are overflowing with examples for well-known writers like James Baldwin, Anais Nin, Mary Karr, Terry Tempest Williams. The text contains a large bibliography and appendix to supplement the text. I do not have one ounce of negative criticism for this book and I highly recommend it for anyone who wants to approach the memoir/personal essay/autobiography in a manner that is literary and articulate. If you’re writing a Memoir, Your Life as Story by Tristine Rainer is for you. If you’re writing fiction, this book has much to offer. If you want to examine a part of your life, or to understand something you’ve experienced, even if you are not a writer, use this book as a guide and try your hand at writing. You may well surprise yourself! Last week, I was scouring the library for resource books on Memoir. I didn't come up with much beyond the handful I'd already dug through, but later the same night, while re-shelving my own books in our new office, I tripped over "Your Life As Story". It's one of the books I bought while researching my thesis on Therapeutic Writing a decade ago and the spine is familiar as any other on my shelf, but I haven't cracked it since September of 2002. I picked up the book, flipped through it and laughed Last week, I was scouring the library for resource books on Memoir. I didn't come up with much beyond the handful I'd already dug through, but later the same night, while re-shelving my own books in our new office, I tripped over "Your Life As Story". It's one of the books I bought while researching my thesis on Therapeutic Writing a decade ago and the spine is familiar as any other on my shelf, but I haven't cracked it since September of 2002. I picked up the book, flipped through it and laughed. If I'd found it in the library, I'd have declared it “Exactly what I was looking for!” and clutched it to my chest while running for the check-out line. Instead, it was waiting casually to be remembered and rescued from deep shelves five feet from where I sleep. Whole sections on structure and craft, were of little interest to me at the time as I was focused on the therapeutic elements of writing but are now incredibly helpful. Chapters on Essential Elements, Voice and the Anatomy of a Scene give clear and solid direction. Chapter Seven, titled “Tricks Memory Plays on You and Tricks You Can Play on It” is especially brilliant. Re-reading those passages brings a little of that fire back to my belly as I wholly agree with and consider myself living proof of the therapeutic value of writing. An obvious example of that is a piece titled "Parting", which I wrote about the process of agreeing to donate my daughter's organs as she lay dying in the room across the hall. Clearly a horrible experience and dreadful subject matter, but immeasurably healing to write out. Even better though is being able to craft those raw emotions into a story whose message is one of hope. This is one of the best single books available on how to write a memoir. It really focuses on the need to find the story in the events, and shape the narrative. The explanation of the elements of story is the clearest thing I have ever read on that topic. The writing is engaging, and she gives great examples. A great writing book, no matter if you are writing fiction or non-fiction. Though the book is geared towards people writing memoir, the section on how to "slice" your life for memoir writing gave me real insight into the narrative arc for fiction, and that the choice of what time period in your character's life that your novel will cover is not arbitrary--it is related to the theme. Rainer is a generous, grounded writer, and offers many true life examples. A very helpful book. I'll share more when I'm done. Essential reading for the memoir or autobiography writer, and useful for novelists, too. The first chapter or two is dry, and I was worried the book would be too academic, but it turned out perfectly practical. I've never read such a great explanation of good story structure (the acts). Plus, there's great advice on "waking up" your memories and powers of observation, writing "what you dare not say," theme, jumping through time, ethical and legal concerns, and more. Excellent book. A good read with easy-to-understand concepts about writing autobiography and memoir. The approachable style and frankness with which the material is presented makes you feel as if you're right there in the author's Literature class. Recommended reading for any aspiring author of memoir. Excellent reference book for people whose intention it is to write a memoir or autobiography. Lots of good examples from other works. I was happy to recognize and relate to many of the writers to which Ms. Rainer refers. No even sure if I finished it all, but I jump here and there to parts that interest me. Eventually, I'm sure it will be the entire book. Despite the title (she does have a thing for the word New and she wants to drive it home!) this was a good book. I do cringe every time I see the word "new" capitalized in the text. It makes me almost jump every time I see it. Oh, there it is again. Goodness. But seriously, if you plan to write an autobiography (whether old or new. or heck, even ancient, archaic, current, or contemporary!) you'll get some good tips here. I think her book on Modern Diary-writing was her best, though. (Oh, okay, Th Despite the title (she does have a thing for the word New and she wants to drive it home!) this was a good book. I do cringe every time I see the word "new" capitalized in the text. It makes me almost jump every time I see it. Oh, there it is again. Goodness. I found this book very helpful in making sense of the crazy path that is writing a memoir. She talks about the shape of a story and gives many techniques for findin the story within the facts and anecdotes of your life. One of my favorite craft books! I used this book to write a memoir and it was extremely helpful. I highly recommend it for anyone writing an autobiography or memoir! I was afraid it would be cheesy or new-age-y, but I'm actually finding it very helpful. She has a talent for putting things that I know subconsciously into a very concrete, usable expression. If only I could I'd give this book six stars, I would. It is packed with good advice on writing memoir. I'll be keeping this in my reference library for years to come. I'm learning from this book how to tell stories in a more compelling way. Everyone who wants to write their life's stories (and that should be everyone) should read this. Full of suggestions. I will use it often as a reference book. 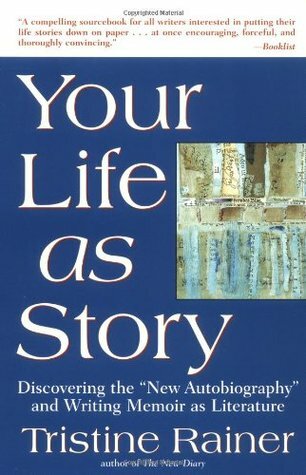 An excellent companion when striving to making meaning of life by writing narrative nonfiction. EXCELLENT. This book provided the tools I needed to write my memoir. I highly recommend it to anyone who has questions about how to go about the process. Save yourself the trouble: do not buy this book. Reading widely in preparation for writing a memoir, I read Mary Karr's "Memoir as Art," (mostly good, see my review). She mentioned this book, so I thought I'd read it as well. It reeks of an atmosphere of Eighties chic: "Lives of the Rich and Famous," et all. I read the first fifty pages and decided to throw it away. Still the best book on memoir that I've ever read. I love Rainer's The New Diary, and when I started getting the itch to work on my autobiography, I decided to look around for books that talked about how to do one. I found this book and have devoured it. Her approach is friendly and scholarly at the same time. She takes you through the history of the form through to how to write your own without boring the hell out of the reader - no mean feat. I'm only a few chapters in on this book but so far it's excellent. I just finished an exercise that had me take a momentous event in my life and turn it into a short fairytale. The compressed format forced me to be short on description and strong on plot points. I'm looking forward to reading more. When my first copy of this book got ruined, I bought another! Rainer's ideas are different from mine in some ways, but I like the way she writes and she did make me think about other pathways that I could choose. This is a book well worth reading. This book sounded good, but after reading about half of it, I wasn't feeling inspired. I may turn back to this to read some of the later chapters, but I already know what I want to write, and pretty much how I want to write it. Comprehensive and encouraging. When I tried the activities, I got good results. I really wanted a book on how to write someone else's biography, but this was the closest I could find at the time. Great instructions so far -- I feel like I'm adding to my skill set.